Mariners Latest: A Gift For The M's! A Gift For The M's! So it's not too often that I write a blog post about another team signing a first baseman, but this one has a direct impact on the Prince Fielder sweepstakes. Anthony Rizzo was traded from the San Diego Padres to the Chicago Cubs this morning. Who cares? Well, anyone who may be interested in Fielder coming to Seattle. The Cubs were one of the teams that were in on Prince Fielder earlier in the month and have laid low in recent weeks. Nobody ever knows truly where a team is at in their bidding until something like this happens. 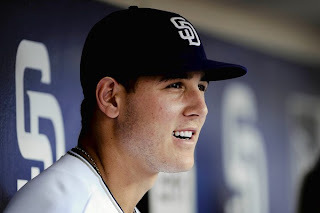 Rizzo is a highly regarded prospect that had a short stint in the MLB with the Padres last year and it didn't go that great, but he has tremendous upside. The Padres had looked at Rizzo as thier future first baseman and now that seems to be where the Cubs have landed. Rizzo will look to fill the first base role for the Cubs as their rising star and therefor the Cubs will move on from the Prince Fielder talks. Does this put San Diego in the bidding for Prince Fielder? Currently they have Yonder Alonso and Jesus Guzman at first base. Both are young first baseman and Yonder just came over from the Reds in a trade for Matt Latos. Alonso was waiting in line behind Joey Votto for the first base job and he would most likely be waiting a long time. I would imagine that the Padres are viewing Yonder Alonso as their future first baseman already. So we know the Orioles are out, the Cubs are out and the Rangers are out for now, depending on what happens with Yu Darvish. The Nationals are out, unless they are in, but they say they are out. The only other team that I can think of besides our beloved Mariners is the mystery team. However, if it is just the Mariners that are left, the price drops massively on Fielder and then all of a sudden a lot more teams are back in again. So, once again, we wait, we watch, we listen and we hope for a better tomorrow.